“Since he did not spare even his own Son for us but gave him up for us all, won’t he also surely give us everything else?”(Romans 8:32 TLB). Learn how to pray prayers that expect answers! Do you sometimes struggle with how to talk and listen to God? The good news is he longs to hear your prayers, whether it’s a bold cry or a whisper. And your words don’t need to be perfect. He delights in you when you come before him—in thanksgiving and petition. Jesus says in John 15:7 . . . So the key to praying with hope and expectation is abiding in Christ—and we want to help you do that with the all-new Daily Hope Prayer Journal. Your faith will be strengthened and you will be blessed as you look back on your written prayers and see how God has faithfully answered them. It has a soft cork-like cover on the outside, while inside you’ll find . . . 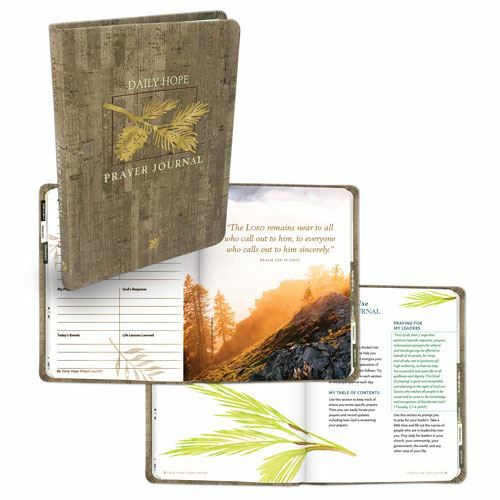 The all-new Daily Hope Prayer Journal is our way to say thanks for your financial support of Daily Hope today. So request yours when you give below. Thank you for your gift to share the hope of Christ through Daily Hope!